The story seemed to be passing. It seemed like everyone was moving on. The Philadelphia Eagles and Terrell Owens are going to part ways. 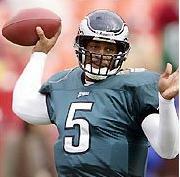 But Donovan McNabb doesn’t appear to be forgetting anything. And as if we needed another story to kill the Super Bowl hype – or lack thereof – McNabb decided to air out his former teammate in an interview with ESPN’s Michael Smith. The problem is; He sounded completely ridiculous. Donovan, what in the hell are you talking about? McNabb is obviously still upset about Rush Limbaugh’s comments from a few years ago and thinks every negative thought about him is because he’s African-American. This had nothing to do with race. Almost definitely, Owens meant that Favre is one of the greatest quarterbacks in league history and then answered a question. Nothing less, nothing more. McNabb went on to indirectly call out his teammates stating that too many players followed Owens’ lead this season. He all but said he felt the team stabbed him in the back and was upset that more people didn’t come to his defense during the whole ordeal. McNabb said he will always remember what happened but if he is the leader that he claims to be, he’d better let it go. Posted by Dan McGowan at 2/02/2006 hype it up!